ROCHESTER, N.Y.– Semrock today announced an important extension of its BrightLine® fluorescence filter sets for microscopy. 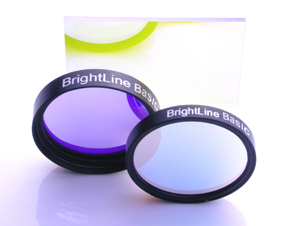 Dubbed BrightLine Basic™, these new value-priced hard-coated filter sets combine the proven "no burn-out" durability of its flagship high-performance BrightLine research filters with optical performance that exceeds that of even premium soft-coated fluorescence filters, yet all at very attractive prices. The permanent performance of all BrightLine filters not only ensures repeatable and accurate measurements year after year, but also further lowers the total cost of ownership. "Semrock has long been known for providing quality optical filters for cutting-edge applications", says Dr. Victor Mizrahi, President & CEO of Semrock. "Now after years of development we have succeeded in tailoring our sophisticated Ion Beam Sputtering filter manufacturing technology to the more cost-conscious market for standard applications. The introduction of these new best-in-class BrightLine Basic fluorescence filters cements Semrock's commitment to also bring quality products to the broad middle market. This level of performance and "no burn-out" reliability is unheard of at these prices." BrightLine Basic fluorescence filter sets are in stock for a wide range of popular fluorophores, including major fluorescent proteins.